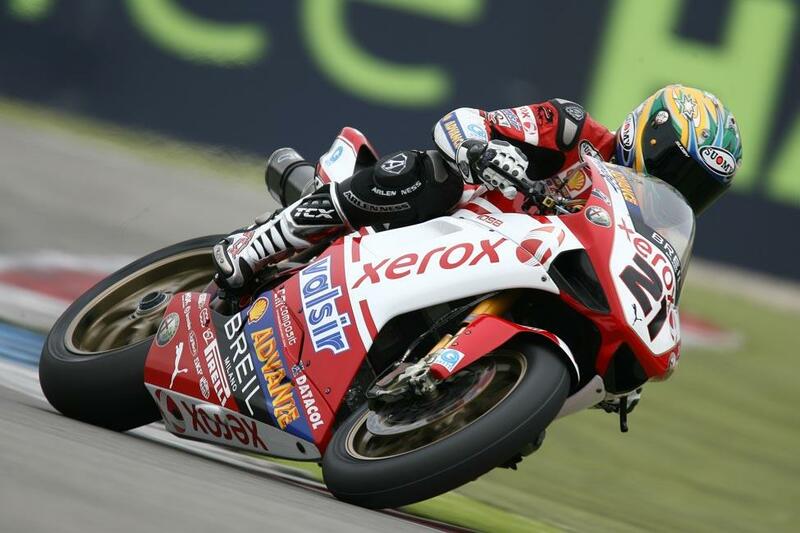 Troy Bayliss has taken the double race win at the Assen round of the World Superbike championships despite a concerted effort from Noriyuki Haga. Haga was the only man to seriously worry Bayliss’ attempt at the win, constantly sitting on the back of the Ducati throughout the 22-lap race. Haga constantly looked like he was trying to get past Bayliss but the two were so evenly matched that he just couldn’t get enough extra pace to pass. It all came down to the last lap and it was clear to see Haga building up for the pass from half way through the lap. It came down to the final chicane when Haga launched forward and came alongside Bayliss as they crossed the line, but it just wasn’t enough to take the win away from the Aussie. Bayliss enjoyed what was his last ever race at Assen so much the first thing he did when he entered the winners enclosure was walk up to Haga and give him a big hug. Ruben Xaus spent most of the race chasing down Max Neukirchner for third, but Neukirchner slowed towards the end leaving Xaus set for a Podium. It wasn’t to be though as Carlos Checa stormed passed in the closing laps to take the third at the flag.